Forge of Empires – A free to play browser game. 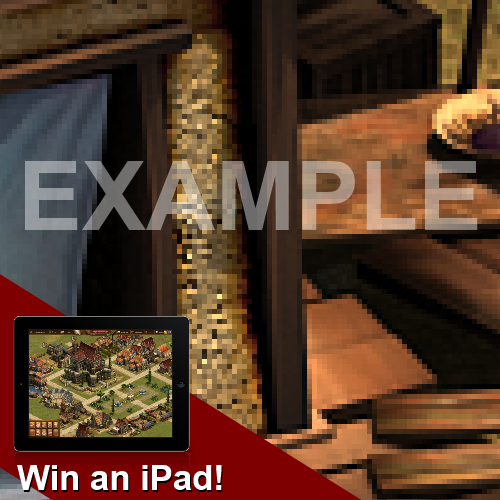 Forge of Empires iPad Contest! Forge of Empires is now available for iPad, and to celebrate the launch, we're giving you the chance to win one of 10 iPads! Every day for 10 days we'll post a picture of a tiny part of a game element on our Facebook wall, and you have to guess what it is by posting a picture of the game item or element you think it belongs to, underneath our post. The element could be from anything within the game... it could be a building, avatar, good or supply, to name just a few! Don't worry, we've made sure that all our images are taken from the early game, so even if you're new to Forge of Empires, you still have a chance to participate. The first person to post a picture of the correct item will win a brand new iPad Air! Hint: Like our Forge of Empires Facebook page to be notified in your news feed about our contest. 2) Once you see the post, start hunting! Each image background represents a game element in Forge of Empires. Once you've figured out what it is, post a screenshot of the element as a reply to our wall post. Add your Forge of Empires account name and your language version (eg. International, US, Italian, etc.) to your post to make sure we can contact you if you're a winner! The first person to post the correct picture wins an iPad Air! •	You must have an existing game account in Forge of Empires. •	Spamming of entries is not permitted. •	Images must clearly depict a single game element (eg. item, avatar, building, etc.). The judges' decision is final. •	InnoGames employees may not enter. •	No more than one prize can be won by any participant. Winners will receive a support notification in their in-game message center. Thank you for playing Forge of Empires, and good luck with the contest!